It is an exciting and profitable time for the beer, wine, and spirits industries in North Carolina. Not only do these booming industries create jobs and stimulate the economy, but they also boost adjacent industries like tourism. Studies show a precipitous rise in the last decade of travelers not only interested in touring and tasting local craft beer, wines, and spirits, but the actual willingness of a tourist to travel to a state or city with the explicit purpose of exploring t hese establishments. This is great news for North Carolina, ranked 12th in volume of craft breweries per state by the Beer Association of the U.S. The number is 115 breweries as of 2014, with 58 more in the planning stage. What&apos;s the economic impact from that, you ask? About $1.2 billion in 2015; and those numbers are trending up. Plus, that&apos;s just the beer! North Carolina also has over 100 wineries and 25 distilleries. The even better news for visitors is that all of these various industries converge in Johnston County which boasts 2 wineries, 2 craft breweries, and a moonshine distillery. Tourists can visit all 5 establishments on our Beer, Wine, and Shine Trail and many visitors are led to the county by other beer, wine, and spirit trails that extend across the state. It is because of this growing relevance between beverage crafting and tourism that I am taking the opportunity to start a new blog series called Meet the Makers. In this series I will sit down with the owners, brewers, distillers, and vintners right here within Johnston County to discuss the hard work and the magic behind what they do every day. 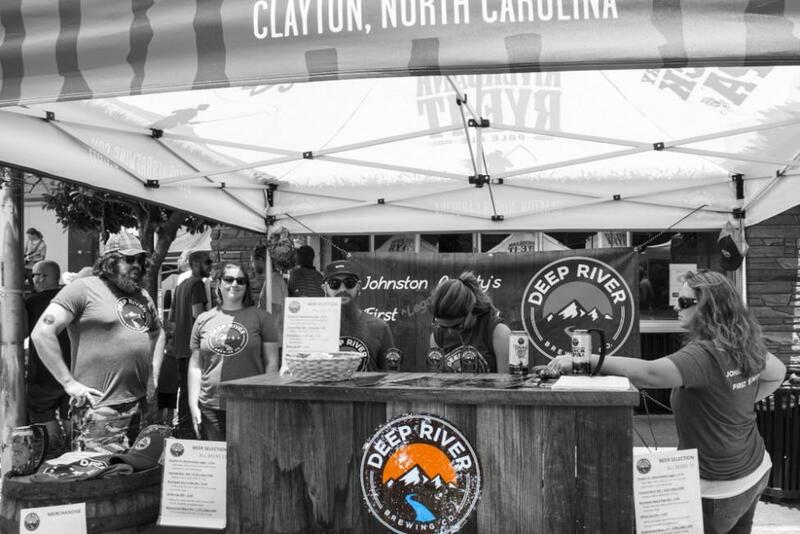 We will start with Deep River Brewing Company located in Clayton, NC and owned by Lynn and Paul Auclair. Sitting down with Lynn and Paul in the office of Deep River, with their large Labrador pups trying to get my attention, I am struck by how welcome I always feel at Deep River. Lynn and Paul themselves are both funny and warm, so pleased with their job and proud of their brewery. Getting to spend time with them is like getting to hang with your really cool cousins. Except that I already have really cool cousins. But, Lynn and Paul own a brewery. It&apos;s different. It&apos;s also amazing how long a conversation can last that starts with, "tell me more about what you do every day." In April of 2013 Deep River Brewing Co. opened 6 months later than planned. It&apos;s ok to talk about it now because the brewery has had such phenomenal success, but to Paul and Lynn it was a time of uncertainty. Not an uncertainty of vision, but at least one of gumption. As Lynn puts it, "there were a lot of sleepless nights - well, there still are - being an entrepreneur is a risky business. A lot of people thought we were crazy." But they had a vision. And a business plan. And a passion for beer acquired through home brewing. So how does one navigate the road from home brewing to a booming craft beer brewery? You get an engineering degree. Just kidding. Sort of. Both Paul and Lynn have engineering degrees that they were putting to good use with corporate jobs. Paul was at a small firm owned by awesome people, with an awesome culture, and by his own admission he might still be there, "but they were bought out and the corporate culture went downhill fast. I wanted to get out. I wanted to start my own venture." Lynn adds, "the brewery wasn&apos;t the first idea to pop into our heads, but it was the only idea that we came up with that both of us really liked." So they took their passion for the craft beer scene and they started conversations with brewers that had come before them, "the craft beer community is full of giving and creative people who were willing to share their stories with us. Then we had to take our business plan to the bank." 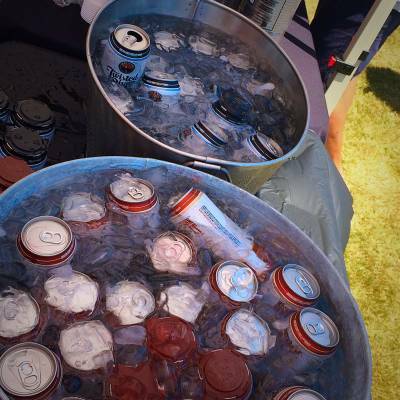 In the spirit of not putting all your eggs in one basket - or all your beers in one case? - the plan was for the brewery to be a side-job and then as Deep River became more successful first Paul and then Lynn would leave their corporate jobs behind. Lynn laughed, "do you know how long that lasted?" Paul interjects, "two weeks. I quit my job two weeks after we opened. There was no way that running a brewery was going to be a side-job." Both are now full-time brewery owners and happier for it. Paul brews and bottles. Lynn works the business side. They are both actively involved in every single aspect of the business, including naming the beers and designing the cans. But I wanted to dial in to the meat and potatoes of the operation... or, in this case, the beer. It turns out that brewing beer is at once super technical and super artistic. You have to have an analytical mind says Paul, "as an engineer I know that research and documentation is my friend. Delicious and consistent beer means getting every aspect of the process down to a science: record keeping, precise equipment, water consistency, yeast pitching rates, hop alpha acids, malt sugar levels." If you&apos;re confused don&apos;t worry, I was too. Lynn laughed at my helpless look, "he reads books about water. Water! It&apos;s crazy." Add to all of that the conundrum of producing at volume and it no longer seems laughable that an engineering degree is necessary to get from home brewing to a 10,000 barrels per year operation. Paul assures me it&apos;s all about understanding efficiency and ingredients. But a good brew master is also one with the ability to create something mystical out of half-cocked ideas. A Leonardo da Vinci of beer, if you will, able to look at styles and ingredients and think, what would happen if? Both Paul and Lynn say you cannot be afraid to experiment. Lynn adds that, "Mango Tango Foxtrot happened because we were trying to get a mango taste out of an IPA without using actual mangos. On the other hand, we actually added real cookies to our holiday beer mash last year." I asked Paul what he likes to dream up first, the beer style or the ingredients. He said it&apos;s a dance, "the craft beer aficionado wants variety. I want to always have a variety of styles on tap, and there are some ingredients and styles that just go together, like putting together great choreography. Right now I&apos;m working on a Berlinerwiesse German-style beer flavored with rhubarb and soured in rum barrels." To each their own, but I think that sounds amazing! Deep River is also aging beer in bourbon and whiskey barrels. It sometimes seems like their more daring adventures have been the most popular. In March of this year they launched Collaboration Without Representation with Bottle Revolution. It was a limited edition Barrel Aged Imperial Chocolate Milk Stout with Coffee using Raleigh Coffee Co beans. Genius. One thing is for sure, aside from awesome beer-making skills, a fledgling brewery needs the ability to grow uninhibited and the power of positive relationships, "we wouldn&apos;t be here now if people hadn&apos;t worked with us and believed in us," says Paul, "from the bank to contractors. We didn&apos;t want to have investors or a board to answer to and so, we had to amass all the start-up capital ourselves." Lynn explains the lack of investors, "we didn&apos;t want that sort of oversight, people trying to turn a profit. We want to love what we&apos;re doing every day, not make a billion dollars." Deep River is proof that great things can happen when people follow passion instead of profit. Not that the brewery isn&apos;t doing well. Both Paul and Lynn expect to see continued positive growth moving into the future. They still plan to handle their own distribution in order to further solidify the relationships they have with their accounts. Lynn had a great point, "nobody cares as much about your beer as you do." The fact that Deep River is continuing to grow in volume and popularity proves that the Auclair&apos;s certainly love their beer. As do their loyal customers and the many visitors who come from out of town to try Deep River for themselves. As of now the brewery is not permitted to distribute outside of North Carolina, but Lynn says that doesn&apos;t stop the calls from coming in, "I had a guy call me the other day from Georgia asking how he could get Deep River on tap in his bar." Most nights that the brewery is open you can find both the inside and outside filled with people drinking beer, enjoying the food truck fair of the evening, listening to music, playing trivia, or any of the other many activities happening at Deep River. 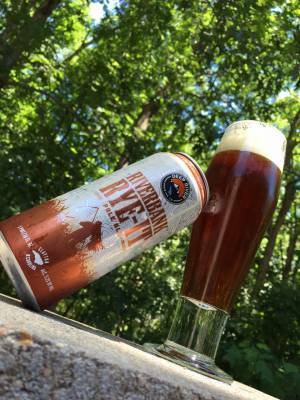 If you&apos;re in the area or visiting the area, next week is an excellent time to try Deep River. Their fall seasonal beer Pumpkin Pie Porter will hit stores and the tap room next Wednesday the 26th of August. 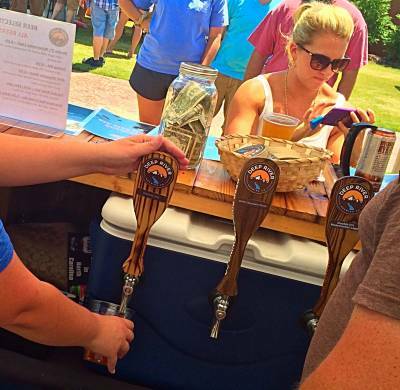 In addition, if you plan on being at any of the festivals around the state look to see if Deep River will be there, they take their beer to over 50 events a year. Establishments like Deep River provide a jolt to the social scene and provide a watering hole for local craft beer lovers. But, they also put Johnston County on the map for visitors to NC who seek out brewers, wineries, distillers, and the experiences and tastes they offer. Thank you to Lynn and Paul Auclair for taking a leap of faith. I can&apos;t wait to see how much deeper the river gets.